For the past few weeks I’ve been challenging myself to eat 500-calorie dinners 5 nights a week from our new book EatingWell 500-Calorie Dinners. I have a small confession to make: I haven’t been sticking to the menus...exactly. I have been keeping my dinners to 500 calories, but I’ve also been making a few substitutions here and there. Check out my menu for this week here. I keep swapping in one thing over and over. No, it’s not wine. And it’s not ice cream. It’s one of my secret weapons for making this diet work for me. It’s quinoa. That’s right. Say it, keen-wah. It’s my new favorite food. Why’s quinoa so magic? It’s a whole grain, which means it has the good stuff—fiber and nutrients. But unlike many whole grains (brown rice, barley, bulgur, wheat berries), which take about 50 minutes to cook, quinoa is ready in about 15 minutes. Plus it has a nutty flavor and a half-cup serving is just 111 calories. Last night I served it with the Indian Wok-Seared Chicken & Vegetables. Next week, I can guarantee I’m going to serve it with recipes for Lamb Chops with Lebanese Green Beans or the Ginger, Split Pea & Vegetable Curry. 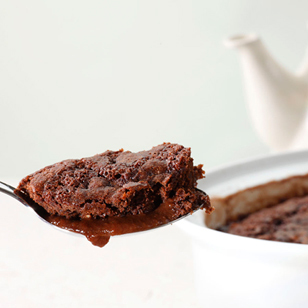 Besides quinoa, I have one other secret weapon that I want to point out this week—Hot Fudge Pudding Cake! I know, how can I mention these two foods in the same sentence? It hardly seems right! But that’s what I love about this book. Yes, it’s full of tons of healthy whole foods—fruits, vegetables, lean meats, seafood and whole grains like quinoa—but it’s also full of amazing recipes that you would never call “diet” food. And not depriving yourself of foods you love, like dessert, is actually a key to diet success. This cake is amazing because it takes 20 minutes to throw together, it bakes for about 25 minutes and it comes out rich, melty and chocolaty and only has 143 calories per serving! And if something like this cake is part of a diet, then this is a way of eating I can truly embrace...forever.